Our cherished pets are now matching us when it comes to levels of obesity and idleness. One in every two dogs and cats in Ireland is overweight or obese due largely to over-eating and under-exercising, according to the head of Veterinary Ireland. And like their human 'parents', fat cats and plump pooches are at a greater risk of contracting cancer, diabetes and other serious diseases as well as having shorter life spans. The latest figures from the World Health Organisation (WHO) show that Ireland is set to become the most obese country in Europe with alarming projections in which 85pc of Irish women and 89pc of Irish men will be obese by 2030. Already 60pc of the Irish population is overweight and obese and, in many cases, it's those same poor eating and exercising habits that are also making our pets fat, according to Dr John O'Connor, chairman of Veterinary Ireland, a representative body for 1,500 veterinarians. Currently about half of all dogs and cats in Ireland are overweight, although cats are better at hiding excess weight because fat tends to form around their organs, he told the Sunday Independent. But if the cat's belly is dangling or you can't feel the outline of a dog's ribs when you run your fingers along their chest, then they are overweight, he said. While we may joke about the cat that got the cream or lazy fat cats lolling around on the sofa, it's no laughing matter, he said. Like humans, excess weight and obesity is a silent killer for dogs and cats, he said. Not only are they more likely to suffer joint pain and stiffness and tire out more easily, obese pets are not physically well and may suffer from breathing problems or even chronic pain. 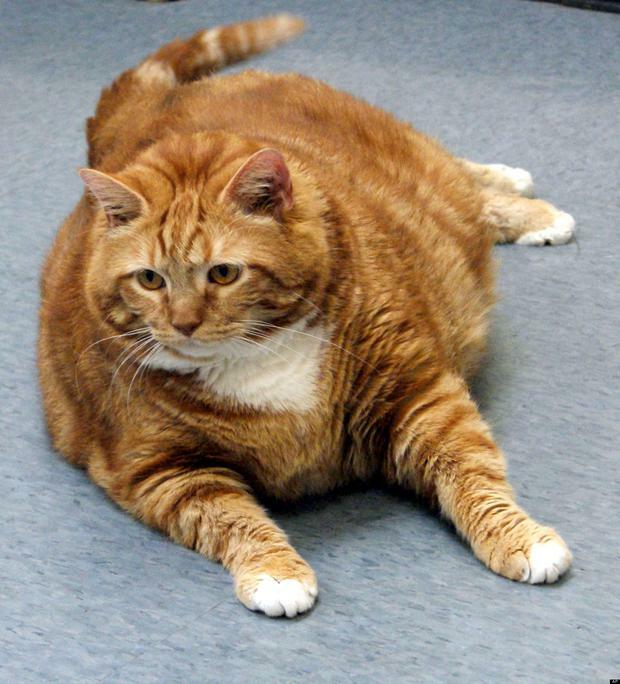 Vets are increasingly calling pet obesity "a chronic, incurable disease", Dr O'Connor said. "We've been conditioned to think it's normal but it's a disease we need to treat," he said. In some cases, pet owners have been prosecuted for animal cruelty or neglect for allowing their dogs and cats to get too big. In Ottawa, Canada, last summer, a cat owner was charged with neglect for allowing her 12-year-old cat to get so fat that he couldn't clean himself or even stand up and had to be put down because he was in so much pain. In the UK last year, two middle-aged brothers were convicted of causing unnecessary suffering to an animal after their Labrador ballooned to over 74kg and he was taken away by the RSPCA but returned to them when he lost 30kg. But the problem of killing pets with kindness is a constant worry for vets, who see pet owners feeding their pets as they would their children or themselves, Dr O'Connor said. While the odd treat is okay, it's doing them more harm than good by giving in to begging at the table or 'rewarding' them with food when they'd be just as happy to have a ball thrown at them, Dr O'Connor said. Some unwitting pet owners are even feeding their pets a steady diet of junk food, including crisps, pizza, burgers and chocolate - which can be lethal to dogs - which is fuelling an epidemic of pet obesity in the UK, according to The People's Dispensary for Sick Animals charity. Even RTE's weight-loss reality show Operation Transformation is now urging dog owners to spend more time out walking with their dogs so that both owner and pooch can shed a few pounds. Dr O'Connor said cat owners should play more with their cats using laser pointers or, ideally, toys to get both cat and owner off the sofa.